A by-product of nicotine may help prevent the plaques linked to Alzheimer's disease from forming. But the by-product itself is toxic, so researchers are hoping to produce an artificial version to help patients. Experts stress people should not smoke in order to protect themselves against the disease. 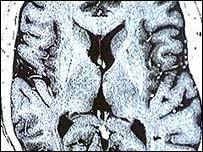 In Alzheimer's, plaques made up of amyloid beta protein form in the brain. Researchers from the Scripps Research Institute in California, US, looked at nornicotine, which is produced as nicotine is broken down by the body. Smoking is certainly not a good way of trying to get this drug to a particular point in the body. They believed it may help protect brain cells. Nornicotine is involved in a reaction between sugars and proteins called glycation. But nornicotine-based glycation is believed to be harmful to the body. In tests, the presence of nornicotine and glucose alongside amyloid beta proteins appeared to prevent the formation of plaques. The researchers, led by Tobin Dickinson, write in the US journal Proceedings of the National Academy of Sciences: "Nicotine and nornicotine treatments are intriguing and potentially valuable treatments for Alzheimer's disease." But they said both were known to be toxic, so more research was needed to develop chemical compounds that mimic the action of nornicotine. Clive Evers, director of information and education for the Alzheimer's Society, said: "This research is test-tube based and provides chemical evidence for why nicotine has been linked to the prevention of Alzheimer's disease. "While this research points to a way forward for future research, smoking is a known risk factor for vascular health and many other diseases. "Most previous research suggests that persistent smoking is more likely to raise rather than lower dementia risk." Deborah Arnott, director of the charity Action on Smoking and Health, told BBC News Online: "Nicotine is an active drug. But smoking is certainly not a good way of trying to get this drug to a particular point in the body. "Smoking itself kills 50% of long-term smokers, half before they reach old age. "And recent research showed that smoking had a detrimental affect on mental activity, rather than a positive one."